Pointy Instrument of Death!, originally uploaded by plingthepenguin. As I said, we didn't just look at the Egyptian stuff in the British Museum - this pic is from our quick trot through the pointy instruments of death section (umm, OK, the "European" galleries, which had many things that weren't instruments of pointy death, but hey I wasn't looking at them this time!). Click through to flickr for a few more pics, including a couple of J looking at things (much more sensibly than myself ;) ) and a couple of the things we saw. 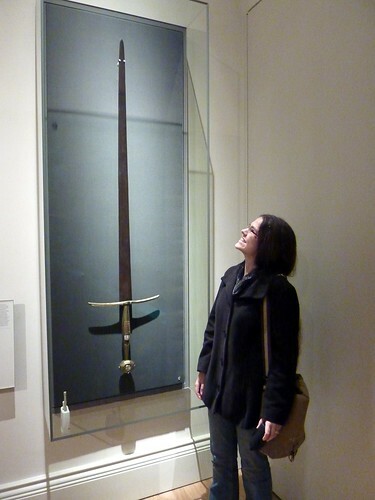 that sword would appear to be longer than you are tall. which is funny. That IS a big sword!